Our Lenten journey continues this Sunday, as we make our way with Jesus toward the decisive events of Holy Week. 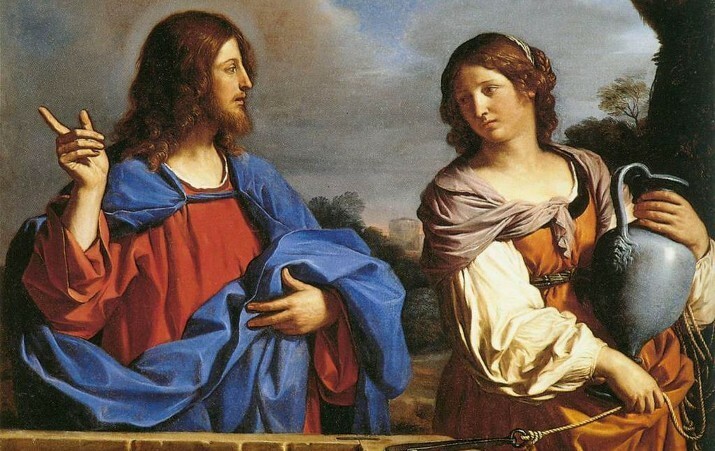 This Sunday John the Evangelist invites us once again to eavesdrop on an unexpected conversation Jesus has with an unnamed woman at Jacob’s well in the region of Samaria. This is the longest extended conversation Jesus has with any individual reported anywhere in the New Testament. Many churches will read the whole account in John 4. Our reading is John 4:5-26. I couldn’t find the name of the artist who rendered the painting above/right, but if you are familiar with the account or read the story now, you might wonder what point in the conversation the artist is depicting. As I see it Jesus is pointing somewhere off the canvas, not up toward heaven, but perhaps back to the town where she came from. The woman, with water jug in hand, seems to me to have a disturbed look on her face, as if she were remembering something painful from her past. Indeed she is, because Jesus has just revealed that he is fully aware of her whole story. Later, when she goes back to her town, she tells everyone that she has met a man who has told her everything about her life! He whole story – the good and the bad, the happy and the sad. In another interesting detail she leaves her water jug at the well. She walked all that way for water in the midday sun and leaves the jug behind? Makes no sense! So it must mean something for faith. Indeed it does. John writes, So the woman left her water jar and went away into town and said to the people, “Come, see a man who told me all that I ever did. Can this be the Christ?” (John 4:28-29) In response to her question, the towns’ people come out to meet Jesus. There is certainly a lot one could talk about in John 4. That’s what we do in our Monday morning Bible study group. You should come! Everyone is welcome. But I want to focus on one thing: that the woman at the well went and told people about her encounter with the Lord, and they, in response, came out to meet him. That makes her one of the first evangelists. In this time and place God calls all of us to be evangelists. Surely like her we know that Jesus knows all about us – our whole story: the happy and sad, the good and the bad, and yet he receives us into a life giving relationship because of His love and mercy for us sinners. The question I put before you as a church family is this: how are we inviting others to come and share the joy of living in Christ’s love? When I think about Shepherd of the Valley it seems to me that the one thing we do NOT do very well is invite people to church, to share our encounter with Jesus in the Word and Sacraments. Someone once said to me, “No of us converts anyone. The best we can do is invite them and let the Holy Spirit work through God’s Word and the Sacraments. The woman at the well was so over joyed to have that unexpected conversation with Jesus that she forgot what she came there for in the first place, and left her jug behind as she went to tell her fellow villagers what happened. So who is your your village? Has anything happened to you for having met Jesus? Who should you be telling about your encounter with Him? Last week Rob Durbin invited the whole OSU racquetball team (he’s the coach) to come to worship and be blessed and prayed for as they travelled to California for their tournament. That was a blessing for us a reminder too that it’s not enough to be friendly. We have to be inviting. The most urgent question that emerges for me as I think about this story in John 4 and our congregation is who should we be inviting? What’s stopping us from being more excited about the Good news of God love in Christ? The water of life flows from God’s Word and the Sacraments Jesus instituted. It would be interesting to ask how things might change if every worshipping member of our church invited at least one person to church every week. You’d get a lot of “no’s” but there could be that one “yes.” Do you think it’s worth the effort? I do.